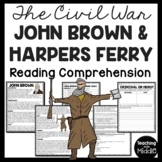 This is a reading passage about John Brown's Raid on Harper's Ferry. There are two versions, for advanced and emerging learners. 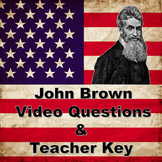 Students will determine the amendments that defended Brown's rights under the Bill of Rights. 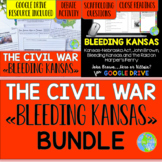 Also included are 3 Reading ELA questions about Text Structure. 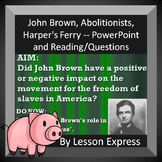 While viewing the "Harpers Ferry" podcast (#57) on www.virginiatrekkers.com, students complete the 9 question quiz. Answer key included. 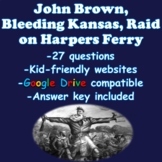 John Brown and the Harper's Ferry Raid: What Happens Next? 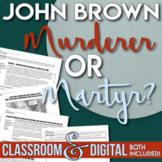 In this lesson, students will get an overview of the impact of Uncle Tom's Cabin, the decision of the Dred Scott v Sanford Supreme Court case, and the events at John Brown's raid at Harper's Ferry. 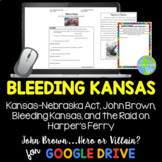 This powerpoint discusses who John Brown was, his background as an anti-slavery activist (and violent histories), and looks at his plan to attack Harper's Ferry in detail. 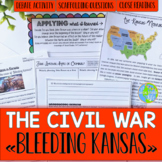 Accompanied by a worksheet with questions for students to answer while discussing the powerpoint.